Founded in 1746, the Langmann winery specializes in Schilcher (Blauer Wildbacher) which is grown almost exclusively in Weststeiermark. It is one of the oldest grape varietals cultivated in Central Europe, dating back to Celtic times. 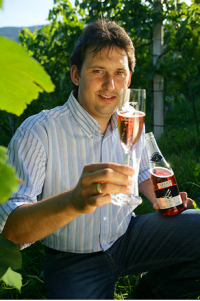 A red wine varietal, Schilcher is made primarily as a rosé—both still and sparkling (Sekt). Schilcher is quite fruit forward, but with a very distinct acidity; a unique terroir wine. Climate: Warm Mediterranean climate with humid Alpine Influence from the Koralpe mountain; in autumn, there are cold nights and warm days. Average rainfall: 800 – 950 mm. Harvest: By hand in two to three sessions in every vineyard. Grape processing: After selective hand harvesting, the grapes are transported to the wine estate immediately for cooling. The gentle processing takes place at 14 °C in an oxygen free environment for preventing oxidation of flavors. The following time of maceration (the time of contact of juice and flavor rich grape skins) is chosen according to the grape material and lasts between 4 and 36 hours. The exact time of pressing is evaluated by tasting the juice. With the following gentle pressing of the grapes, juice runs into the cellar only with the help of gravity. After sedimentation (the natural settling of grape pulp, where only clear juice remains), the juice (grape must) is taken to fermentation. Fermentation takes place under cooled conditions for expressing a maximum of flavors in the wine. All sparkling wines are fermented in stainless steel – Method Charmat .